When you are looking for a facial piercing, especially a lip piercing, there are a wide assortment to choose from but finding the one just right for you may be a challenge. From the Monroe to Viper Bites, the placement of your lip piercing is increasingly able to be customized. 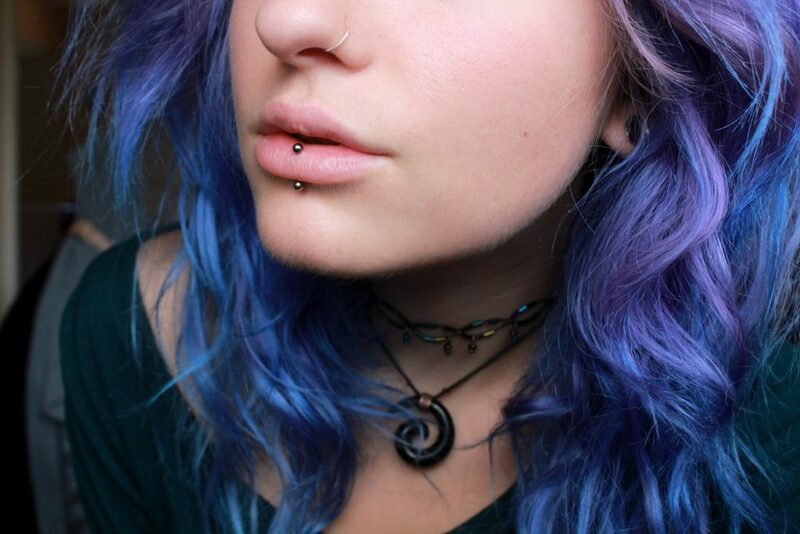 One of the hottest piercings right now is the Inverted Labret. So what is this style that is causing all the stir? Let’s take a look. In inverted labret goes from inside the mouth and emerges in the center of the lower lip. It is one of the piercings that is actually into the soft tinted skin of the lip as opposed to on the outer edges or corners in the fleshier section. It differs from a vertical labret in the fact that there is only one end exposed and from a traditional labret by placement since that is usually done just below the actual lip in the flesh underneath the lip. There are some things to keep in mind when considering this type of piercing. First, any piercing that goes through the actual lip does have more of a tendency to form a scar. That means if you ever choose to remove it, you will likely have a dark spot on your lip. For females, this is a fairly minor concern and easily disguised with a bit of makeup but for males and those that prefer a natural look, it can be a big factor. The second factor is as always healing. The time between new and healed tends to run around 12 weeks. Not one of the slowest healers but by no means one of the fastest either. During the healing process you can’t use alcohol based mouthwashes, regular facial soap, moisturizers, or sunblock on the area. That also means it’s best to stay away from lip balms and cosmetics. You will need to do regular rinses with a sea salt solution but maintenance overall is pretty simple for this placement. How Much Does It Hurt To Get One? So, if you do choose an inverted labret, the inevitable question becomes how much will it hurt? The great news here is that it registers fairly low on the pain scale for most people. It is more uncomfortable than earlobes, eyebrows, and navel but only by a little. If you have had a tongue piercing or cartilage done in your ear, you are very likely to be able to handle the discomfort of this piercing location since it only rates about 2 stars on a 5 star scale making it less painful for the most part even than an industrial piercing. The next step in your journey to sport the exceedingly hot inverted labret is to find a great piercing studio and select a piece of jewelry that you can love for at least the next three months. Once the selection is made, it is a fairly quick and easy process that usually bleeds very little if at all. The only question left is how soon are you going to be showing off your new piercing? Most kinds of lip piercings pose a threat to your oral health as your jewelry can damage your teeth and/or gums. This is most likely to happen in the first months after having a piercing because your starter jewelry should be larger than jewelry you might choose later on. This is to avoid the jewelry pressing into your skin and causing tissue death (necrosis) and/or infection, and consequently, bad scarring. You also have to be very careful when eating that you don’t bite down on your jewelry and break or seriously damage one or more teeth. Some piercing experts recommend getting a ring inserted instead of a labret stud while the site is healing. One option is to get a niobium lip ring, which is softer and more flexible than rings made out of titanium or steel. The soft texture of niobium, what is known as a ‘transition metal,’ makes it safer for the teeth and gums. Even if you do chow down on it, it’s less likely to cause damage to your teeth. Otherwise, if you want to stick with a labret stud, you could go for BioPlast labret studs, which are also softer and more flexible than metal labret studs. This makes them gentler on the gums and teeth than the metal kind. As the stud is in constant contact with the gums, a metal labret stud can cause your gums to recede, which in turn could compromise the long-term safety of your teeth.